So, you wanna be an astronaut? Virgin Galactic says they can help you accomplish that for $250,000, and boasts they have over 800 space tourists lined up to go to space. However, the qualification for claiming you actually went to space is under debate. The official altitude for "space" recognized by the Federation Aeronautique Internationale is 100 kilometers (62 miles), while the fine print in the Virgin Galactic contract promises an altitude of "about 50 miles," reported by the International Business Times. The federation says that flyers will not be recognized as astronauts if they don't meet the 62-mile mark, known at the Karman Line. I don't know about you, but if I'm going to pony up a quarter of a million dollars for the flight, it better be official that I went to space. Virgin did tell the IBT they are "working towards" the official barrier. Sir Richard Branson leans out a window of the WhiteKnight (Getty Images). 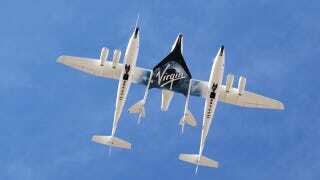 Virgin Galactic has also revealed that defects have been found in the wings of the WhiteKnight 2, the launch plane for its SpaceShip 2. Sources have said the wings have cracks, but Virgin has described them as "adhesive imperfections." The space tourism plan was originally spawned by Sir Richard Branson in 2004, with the goal of being operational with customers by 2007. The WhiteKnight 2 has not flown since January, but Branson says it will be back in the air by June. The wing faults have delayed the program once again, pushing the first customer launches into next year.